I'm new on Eurobricks, but not to the world of LEGO. I'm building for 1,5 years now and this WW2 build I made back in 2017 for a contest on Flickr. If you like what you see give me a follow on Flickr, Instagram, YouTube, Facebook and/or Pinterest. 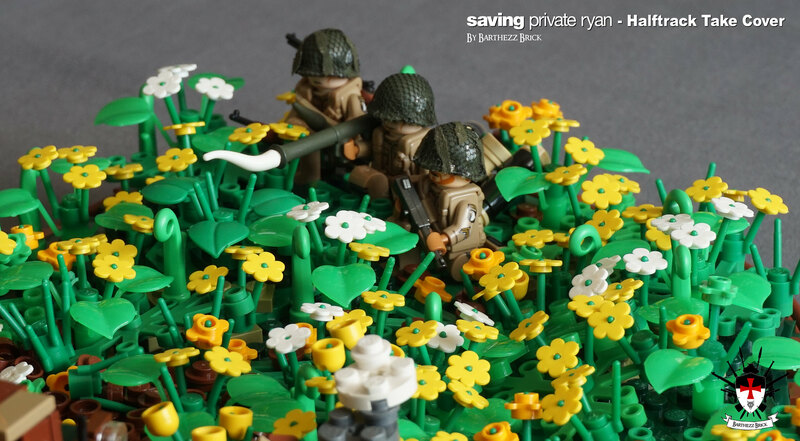 I build an accurate scene from the movie 'Saving Private Ryan'. I did some extended research to make this scene as accurate as possible. The hardest thing to figure out was the placement of each soldier. Second of all that the halftrack came in from behind and that Captain Miller and his men had to turn around 180 degrees so that the wouldn't be attacked from behind. Eventually Captain Miller and his men where surprised by the explosion from the other side of the halftrack. By the second hit Captain Miller and his men came into action and ambushed the small recon unit of the 2nd SS Panzer Division by surprise. Those German Soldiers didn't know what hit them! After the battle they found out that a small 101st Airborne squad from the 506h PIR was following them up close and took out that 2nd SS Panzer Division halftrack. Hope you'll like what you see! More detailed pictures on my Flickr account!